We did our first challenge on November 11th 2011. Nearly 6 years ago. We’ve done over 10 since then with 30-50 participants per series. And each time brought new insights that I then rolled into the next challenge. To provide any committed person the opportunity to achieve sustainable but dramatic results in body transformation, energy, and performance by providing an educational framework of evidence-based, principle-driven nutritional guidance; and a simple, systematic habit-based way of implementing and adapting it into a busy life. To provide any committed person the opportunity…. Notice I did not say *every* person. Nor did I say *guarantee* results. I used to think that I had to make this challenge so unfathomably paint-by-numbers simple so that EVERY person would do it. I realized a few years into helping people with diets that lots of people will say they want to improve their diet but in reality, simply aren’t ready to change. They only kind of want to and no amount of hoop-jumping I do will turn mediocre effort into dramatic success. Something that most gurus don’t tell you is that weight-loss and nutrition is about 80% formulaic and 20% riddle. 80% of what you do is going to produce a predicable result. Eat more, gain. Eat less, lose. But in the other 20% lies the mysteries of the universe. It’s the wildcard part of you we can’t quantify because you’re the only one with your exact fitness level, ancestry, genetics, hormone-levels, and health. I don’t know why you plateaued for 3 weeks then lost 6 pounds in one day. I don’t know why you dieted for 3 days and gained two pounds. There is an aspect of embarking on a weight-loss journey that is like tinkering with a rubics cube. The answers aren’t always neatly displayed in the back of the book. You have to be patient, stay the course, and try things out without giving up. I’ve had people utterly convinced they would never lose weight and then suddenly figure out why nothing worked. Because they kept tinkering. They solved the riddle that was their unique situation. There’s an aspect of this stuff that Dr. Oz probably hasn’t covered yet and you’re going to have to figure it out. That’s ok. Knowing this ahead of time helps. Plus, we’ll be there to guide you. This plan will arm you will every tool and hard-earned bit of knowledge I have in terms of nutrition and fatloss that if you really work for it the entire time, you will almost certainly get what youre looking for. Young, old, injured, sick, healthy, busy, doesn’t matter. The next snippet of this mission statement reveals a bit more of my intent. I want “Holy S$$$” what have you been doing?! !” kind of results for our clients. But not at the expense of sustainable. This is why I don’t do extreme fad diets or shake cleanses. I don’t want you to get results. I want you to keep results. This is why, although the challenges we do might be really tough, they are ultimately based on changing your habits, teaching you to use food as fuel, and not using a diet as a band-aid solution. I don’t expect you to look like you do on the last day of a challenge forever. My hope is that you are always “30 days away”. Meaning you always know, because of what you learned doing a challenge, how to get back to “fighting shape” in no more than 30 days. I think it’s a really bad place to be to have to jump on and off a particular diet every couple weeks because you think it’s the only thing that works for you. Lose 10. Gain 8. Lose 6. Gain 5. Gain 3. Gain. Gain. Gain. If you think you have to take dramatic measures every time you want to lose weight and if you find yourself yo-yo-ing you should rethink how you think about eating. Eating is as much a skill as anything and I want you to lean to use it as a tool to serve you; not the other way around. a simple, systematic way of implementing and adapting it into a busy life. The challenge we do relies on nothing else but self-quantifying. It forces you to see exactly what you’re putting in your body via tracking and in turn, make better decisions. We then tell you what quantities of each foodstuffs you should be eating. The rest is all psychology. I can give you 20 variations of grocery lists of “fat-burning” foods. ….and 1000 “easy and healthy” recipes. But a simple google search would give you far more than I ever could. Fat-burning foods, shake and meal recipes is just information. I think you and I agree it’s not a matter of knowing that you need to eat veggies and lean protein. It’s getting yourself to do it. And you can’t do it if it’s not flexible. Some of us are moms. Some are traveling workaholics. Some are retired or in college. What you learn about eating can be adapted to whatever situation you find yourself in with a little creativity and resourcefulness. And I always make our plans as pliable to a hectic life as possible. So sorry to babble on but that is my mission here. We are going to being the next challenge this month. The 6 week intensive will be much like the transformation challenges we have done in the past. The key difference will be that the challenge will be almost exclusively online (i.e. location independent). There won’t be in-person meetings. You will be given all the materials via email and instructions for beginning the challenge will be delivered via online video. I’m encountering challenges with scheduling as time goes on and after lots of thinking, for the long term I think structuring the challenge this way will allow them to run smoother, reach more people, and perhaps hold them more frequently. We of course all train together and as one of your coach’s I will still have plenty time to talk with you and answer your questions. Only now I won’t need to schedule 20 make-up sessions for people who couldn’t make the initial meeting. 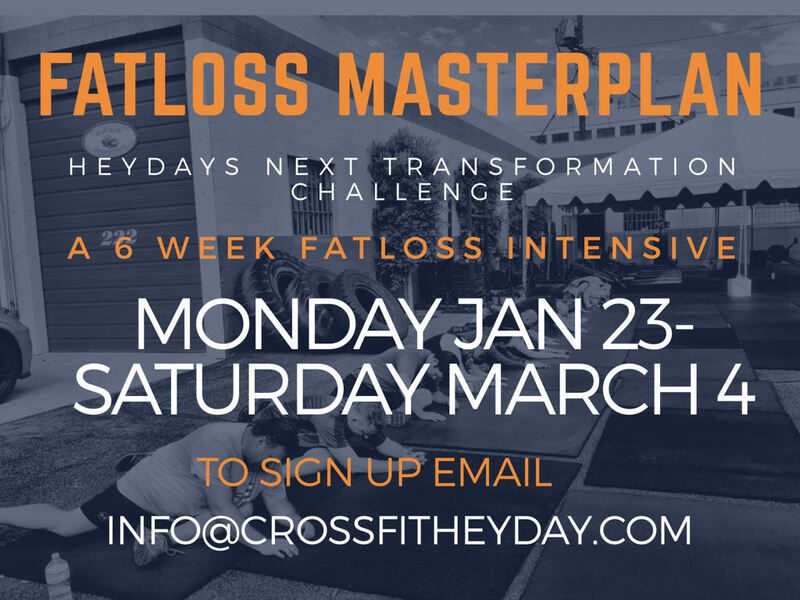 Prior to beginning the challenge we will set your weight-loss objectives and set your caloric and macro-nutrient goals based on your age, fitness level, and bodyweight/fatloss goals. You will be provided grocery lists, sample meal plans, a private Facebook support group, and email access to ask your questions and help guide you the entire way. In addition you will be given a 6 week HIIT Cardio Fatloss Plan and 6 week 6-pack AB Routine that will rapidly accelerate your fatloss results (and you’ll be able to do in an hour total per week). You will also be given accountability through tracking and check-ins. If you have done a transformation challenge in the past you already have the tools and know the basic principles of my approach towards fat-loss. If you however still feel like you need the accountability do it. If you’ve never done a Heyday transformation challenge and want a fad-free approach to real lasting results do it! !